This randomised controlled trial looked at the efficacy of an occlusal splint or joint mobilization self-exercise for confirmed anterior disc displacement without reduction (ADDwoR). The researchers found significant improvement in all variables at eight weeks with the mouth opening range increasing more in the exercise group than in the splint group. Joint mobilization self exercise is an effective treatment option for improving jaw function and reducing pain and limitations of daily activities in patients with ADDwoR. 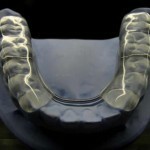 Haketa T, Kino K, Sugisaki M, Takaoka M, Ohta T. Randomized clinical trial of treatment for TMJ disc displacement. J Dent Res. 2010 Nov;89(11):1259-63.